The ECS LIVA Z Plus is a mini-PC with far more capable processors than the non-Plus variants of the current LIVA family, and we have for review a version with the top-end Intel Core i5-7300U CPU option, along with a 128GB SSD and 4GB of RAM. These specs position the LIVA Z Plus against similarly-powered Intel NUC mini-PCs, and the LIVA has the advantage of being ready to go out of the box (just add an OS). We recently took a look at the entry-level ECS LIVA mini-PC, which is a fanless device equipped with a low-power Intel Apollo Lake Celeron N3350 in its base configuration (as reviewed). The performance was merely 'okay' for most desktop computing, and that entry-level LIVA Z was more of a need-specific choice, useful for some applications such as a DIY router as it includes dual NICs in addition to the wireless networking on board. But I kept wishing I had more CPU power the entire time I was testing out the base LIVA Z, and the Plus version seemed like the perfect solution. There is just one catch: it isn't fanless. (Gasp!) Was this an issue? Was it even audible? How were thermals with a 15W Intel Core i5 processor inside such a small enclosure, even it is was being actively cooled? Read on to find out! Package contents are identical to that of the non-Plus LIVA, as we are presented with the LIVA Z Plus, power adapter, and VESA mount. The LIVA Z Plus is externally identical to the LIVA Z, with the same complement of three USB 3.1 Gen1 ports, a USB 3.0 Type-C port, and 3.5 mm audio jack on the front, and dual NICs, HDMI 1.4, and mini DisplayPort on the back. The side panels are also identical to the passively-cooled LIVA Z, with vented sides that in this case allow for intake and exhaust for the small internal fan. Next we'll take a look inside and then see how it performed with a few benchmarks. Continue reading our review of the ECS LIVA Z Plus!! The LIVA family of mini PCs has been refreshed regularly since its introduction in 2014, and the LIVA Z represents a change to sleek industrial design as well as the expected updates to the internal hardware. The LIVA Z we have for review today is powered by an Intel Apollo Lake SoC, and the product family includes SKUs with both Celeron and Pentium processors. Our review unit is the entry-level model with a Celeron N3350 processor, 4GB memory, and 32GB storage. Memory and storage support are improved compared to past LIVAs, as this is really more of a mini-PC kit like an Intel NUC, as the LIVA Z includes an M.2 slot (SATA 6.0 Gbps) for storage expansion, and a pair of SODIMM slots support up to 8 GB of DDR3L memory (a single 4GB SODIMM is installed by default). The LIVA Z is a very small device, just a bit bigger than your typical set-top streaming box, and like all LIVAs it is fanless; making it totally silent in operation. This is important for many people in applications such as media consumption in a living room, and like previous LIVA models the Z includes a VESA mount for installation on the back of a TV or monitor. So how does it perform? We will find out! Continue reading our review of the ECS LIVA Z fanless mini PC! The latest iteration of the Apple MacBook Pro has been a polarizing topic to both Mac and PC enthusiasts. Replacing the aging Retina MacBook Pro introduced in 2012, the Apple MacBook Pro 13-inch with Touch Bar introduced late last year offered some radical design changes. After much debate (and a good Open Box deal), I decided to pick up one of these MacBooks to see if it could replace my 11" MacBook Air from 2013, which was certainly starting to show it's age. I'm sure that a lot of our readers, even if they aren't Mac users, are familiar with some of the major changes the Apple made with this new MacBook Pro. One of the biggest changes comes when you take a look at the available connectivity on the machine. Gone are the ports you might expect like USB type-A, HDMI, and Mini DisplayPort. These ports have been replaced with 4 Thunderbolt 3 ports, and a single 3.5mm headphone jack. While it seems like USB-C (which is compatible with Thunderbolt 3) is eventually posed to take over the peripheral market, there are obvious issues with replacing all of the connectivity on a machine aimed at professionals with type-c connectors. Currently, type-c devices are few and are between, meaning you will have to rely on a series of dongles to connect the devices you already own. I will say however, that it ultimately hasn't been that much of an issue for me so far in the limited time that I've owned this MacBook. In order to evaluate how bad the dongle issue was, I only purchased a single, simple adapter with my MacBook which provided me with a Type-A USB port and a pass-through Type-C port for charging. Continue reading our look at using the MacBook Pro with Windows! A few days ago, sharp eyes across the internet noticed that Nintendo’s Switch console has been added to lists of compliant hardware at The Khronos Group. Vulkan 1.0 was the eye-catcher, although the other tabs also claims conformance with OpenGL 4.5 and OpenGL ES 3.2. The device is not listed as compatible with OpenCL, although that does not really surprise me for a single-GPU gaming system. The other three APIs have compute shaders designed around the needs of game developers. So the Nintendo Switch conforms to the latest standards of the three most important graphics APIs that a gaming device should use -- awesome. In other news, Eurogamer / Digital Foundary and VentureBeat uncovered information about the hardware. 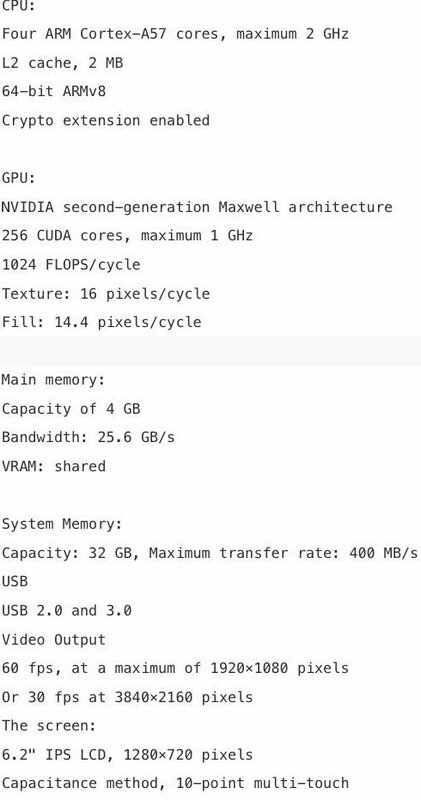 It will apparently use a Tegra X1, which is based around second-generation Maxwell, that is under-clocked from what we see on the Shield TV. When docked, the GPU will be able to reach 768 MHz on its 256 CUDA cores. When undocked, this will drop to 307.2 MHz (although the system can utilize this mode while docked, too). This puts the performance at ~315 GFLOPs when in mobile, pushing up to ~785 GFLOPs when docked. Yup, the Switch’s performance rating is calculated as FP16, not FP32. Snippet from an alleged leak of what Nintendo is telling developers. If true, it's very interesting that FP16 values are being discussed as canonical. Reducing shader precision down to 16-bit is common for mobile devices. It takes less transistors to store and translate half-precision values, and accumulated error will be muted by the fact that you’re viewing it on a mobile screen. The Switch isn’t always a mobile device, though, so it will be interesting to see how this reduction of lighting and shading precision will affect games on your home TV, especially in titles that don’t follow Nintendo’s art styles. That said, shaders could use 32-bit values, but then you are cutting your performance for those instructions in half, when you are already somewhat behind your competitors. As for the loss of performance when undocked, it shouldn’t be too much of an issue if Nintendo pressures developers to hit 1080p when docked. If that’s the case, the lower resolution, 720p mobile screen will roughly scale with the difference in clock. Lastly, there is a bunch of questions surrounding Nintendo’s choice of operating system: basically, all the questions. It’s being developed by Nintendo, but we have no idea what they forked it from. NVIDIA supports the Tegra SoC on both Android and Linux, it would be legal for Nintendo to fork either one, and Nintendo could have just asked for drivers even if NVIDIA didn’t already support the platform in question. Basically, anything is possible from the outside, and I haven’t seen any solid leaks from the inside. The Nintendo Switch launches in March. A couple of years ago, I performed an experiment around the GeForce GTX 750 Ti graphics card to see if we could upgrade basic OEM, off-the-shelf computers to become competent gaming PCs. The key to this potential upgrade was that the GTX 750 Ti offered a great amount of GPU horsepower (at the time) without the need for an external power connector. Lower power requirements on the GPU meant that even the most basic of OEM power supplies should be able to do the job. That story was a success, both in terms of the result in gaming performance and the positive feedback it received. Today, I am attempting to do that same thing but with a new class of GPU and a new class of PC games. The goal for today’s experiment remains pretty much the same: can a low-cost, low-power GeForce GTX 1050 Ti graphics card that also does not require any external power connector offer enough gaming horsepower to upgrade current shipping OEM PCs to "gaming PC" status? Our target PCs for today come from Dell and ASUS. I went into my local Best Buy just before the Thanksgiving holiday and looked for two machines that varied in price and relative performance. The specifications of these two machines are relatively modern for OEM computers. The Dell Inspiron 3650 uses a modest dual-core Core i3-6100 processor with a fixed clock speed of 3.7 GHz. It has a 1TB standard hard drive and a 240 watt power supply. The ASUS M32CD-B09 PC has a quad-core HyperThreaded processor with a 4.0 GHz maximum Turbo clock, a 1TB hybrid hard drive and a 350 watt power supply. Both of the CPUs share the same Intel brand of integrated graphics, the HD Graphics 520. You’ll see in our testing that not only is this integrated GPU unqualified for modern PC gaming, but it also performs quite differently based on the CPU it is paired with. Continue reading our look at upgrading an OEM machine with the GTX 1050 Ti!! Dell's premium XPS notebook family includes both 15 inch and 13 inch variants, and ship with the latest 6th-generation Intel Skylake processors and all of the latest hardware. But the screens are what will grab your immediate attention; bright, rich, and with the narrowest bezels on any notebook courtesy of Dell's InfinityEdge displays. Since Ryan’s review of the XPS 13, which is now his daily driver, Dell has added the XPS 15, which is the smallest 15-inch notebook design you will find anywhere. The XPS 13 is already "the smallest 13-inch laptop on the planet", according to Dell, giving their XPS series a significant advantage in the ultrabook market. The secret is in the bezel, or lack thereof, which allows Dell to squeeze these notebooks into much smaller physical dimensions than you might expect given their display sizes. But you get more than just a compact size with these XPS notebooks, as the overall quality of the machines rivals that of anything else you will find; and may just be the best Windows notebooks you can buy right now. Is this simply bluster? Notebooks, like smartphones, are a personal thing. They need to conform to the user to provide a great experience, and there are obviously many different kinds of users to satisfy. Ultimately, however, Dell has produced what could easily be described as class leaders with these machines. Continue reading our review of the Dell XPS 13 and 15 notebooks!! I'm guilty. I am one of those PC enthusiasts that thinks everyone knows how to build a PC. Everyone has done it before, and all you need from the tech community is the recommendation for parts, right? Turns out that isn't the case at all, and as more and more gamers and users come into our community, they are overwhelmed and often under served. It's time to fix that. This cropped up for me personally when my nephew asked me about getting him a computer. At just 14 years old, he had never built a PC, watched a PC be constructed - nothing of that sort. Even though his uncle had built computers nearly every week for 15 years or more, he had little to no background on what the process was like. I decided that this was perfect opportunity to teach him and create a useful resource for the community at large to help empower another generation to adopt the DIY mindset. Part 1 - Introduce the array of PC components, what the function of each is and why we picked the specific hardware we did. Part 3 - Walk through the installation of Windows and get him setup with Steam and the idea of modern PC gaming. Each of the above sections was broken up into a separate video during our day at the office, and will be presented here and on our YouTube channel. I would like to thank Gigabyte for sponsoring this project with us, providing the motherboard, graphics card and helping work with the other vendors to get us a great combination of hardware. Visit them at Gigabyte.com for the full lineup of motherboard, graphics cards and more!! Selecting the parts to build a PC can be a daunting task for a first timer. What exactly is a motherboard and do you need one? Should you get 2 or 4 or more memory modules? SSD vs HDD? Let's lay it all out there for you. The specific configuration used in Austin's PC build is pretty impressive! Continue reading My First PC Build on PC Perspective!! "What's the Point of Steam OS?" Ars Technica UK published an editorial called, Hey Valve: What's the point of Steam OS? The article does not actually pose the question in it's text -- it mostly rants about technical problems with a Zotac review unit -- but the headline is interesting none-the-less. Here's my view of the situation. There's two parts to this story, and both center around Windows 8. The first was addressed in an editorial that I wrote last May, titled The Death of Media Center & What Might Have Been. Microsoft wanted to expand the PC platform into the living room. Beyond the obvious support for movies, TV, and DVR, they also pushed PC gaming in a few subtle ways. The Games for Windows certification required games to be launchable by Media Center and support Xbox 360 peripherals, which pressures game developers to make PC games comfortable to play on a couch. They also created Tray and Play, which is an optional feature that allows PC games to be played from the disk while they installed in the background. Back in 2007, before Steam and other digital distribution services really took off, this eliminated install time, which was a major user experience problem with PC gaming (and a major hurdle for TV-connected PCs). It also had a few nasty implications. Games for Windows Live tried to eliminate modding by requiring all content to be certified (or severely limiting the tools as seen in Halo 2 Vista). Microsoft was scared about the content that users could put into their games, especially since Hot Coffee (despite being locked, first-party content) occurred less than two years earlier. You could also argue that they were attempting to condition PC users to accept paid DLC. Regardless of whether it would have been positive or negative for the PC industry, the Media Center initiative launched with Windows Vista, which is another way of saying “exploded on the launch pad, leaving no survivors.” Windows 7 cleared the wreckage with a new team, who aimed for the stars with Windows 8. They ignored the potential of the living room PC, preferring devices and services (ie: Xbox) over an ecosystem provided by various OEMs. If you look at the goals of Steam OS, they align pretty well with the original, Vista-era ambitions. Valve hopes to create a platform that hardware vendors could compete on. Devices, big or small, expensive or cheap, could fill all of the various needs that users have in the living room. Unfortunately, unlike Microsoft, they cannot be (natively) compatible with the catalog of Windows software. This may seem like Valve is running toward a cliff, but keep reading. What If Steam OS Competed with Windows Store? Windows 8 did more than just abandon the vision of Windows Media Center. Driven by the popularity of the iOS App Store, Microsoft saw a way to end the public perception that Windows is hopelessly insecure. With the Windows Store, all software needs to be reviewed and certified by Microsoft. Software based on the Win32 API, which is all software for Windows 7 and earlier, was only allowed within the “Desktop App,” which was a second-class citizen and could be removed at any point. This potential made the PC software industry collectively crap themselves. Mozilla was particularly freaked out, because Windows Store demanded (at the time) that all web browsers become reskins of Internet Explorer. This means that Firefox would not be able to implement any new Web standards on Windows, because it can only present what Internet Explorer (Trident) draws. Mozilla's mission is to develop a strong, standards-based web browser that forces all others to interoperate or die. Remember: “This website is best viewed with Internet Explorer”? Executives from several PC gaming companies, including Valve, Blizzard, and Mojang, spoke out against Windows 8 at the time (along with browser vendors and so forth). Steam OS could be viewed as a fire escape for Valve if Microsoft decided to try its luck and kill, or further deprecate, Win32 support. In the mean time, Windows PCs could stream to it until Linux gained a sufficient catalog of software. This is where Steam OS gets interesting. Its software library cannot compete against Windows with its full catalog of Win32 applications, at least not for a long time. On the other hand, if Microsoft continues to support Win32 as a first-class citizen, and they returned to the level of openness with software vendors that they had in the Windows XP era, then Valve doesn't really have a reason to care about Steam OS as anything more than a hobby anyway. Likewise, if doomsday happens and something like Windows RT ends up being the future of Windows, as many feared, then Steam OS wouldn't need to compete against Windows. Its only competition from Microsoft would be Windows Store apps and first-party software. I would say that Valve might even have a better chance than Microsoft in that case.